Online Visual Math - Addition Math Drill Maker (Horizontal) - NEW! This online/interactive visual math addition, will create 1 digit by 1 digit (1x1) picture only equations, and it will automatically graded/scored your results in a printable worksheet. No Timed-Test. Visual Math - Addition Worksheet Maker (Horizontal) - NEW! 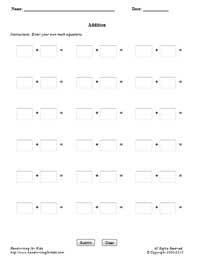 This math worksheet maker will create a horizontal visual math addition, 1 digit by 1 digit (1x1) picture only equations with the handwriting lines. 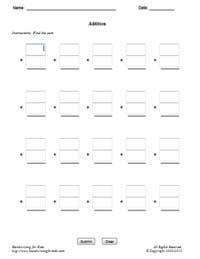 This math worksheet maker will create a horizontal visual math addition, 1 digit by 1 digit (1x1) picture only equations without the handwriting lines. Addition Worksheet Maker (Horizontal) - NEW! This worksheet generator will create your own customized/personalized visual math addition worksheet. 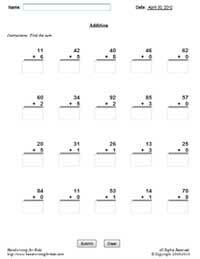 You enter your own math problems to create your own picture only printable worksheet. Addend ranges between 0 and 20 only. Online Math - Addition Math Drill Maker (Vertical) - NEW! This online/interactive math addition generator will provides plenty of online math practice, boost test scores and prepare the child/children to meet the Kindergarten, Grade 1, and Grade 2 curriculum standards. This online/interactive math addition, will create the vertical 1 digit by 1 digit (1x1) equations with an option of timed test, and it will automatically graded/scored your results in a printable worksheet. Addition Worksheet Maker (Vertical) - NEW! This printable basic math addition worksheet generator will provides plenty of math practice, boost test scores and prepare the child/children to meet the Kindergarten, Grade 1, and Grade 2 curriculum standards. 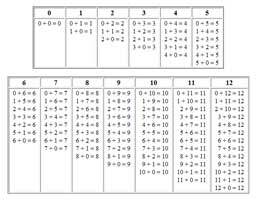 This math worksheet maker will create the vertical math addition, 1 digit by 1 digit (1x1) equations with handwriting lines. 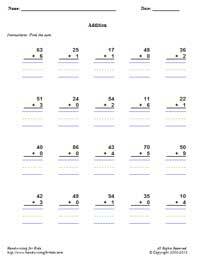 This printable basic math addition worksheet generator will provides plenty of math practice, boost test scores and prepare the child/children to meet the Kindergarten, Grade 1, and Grade 2 curriculum standards. This math worksheet maker will create the vertical math addition, 1 digit by 1 digit (1x1) equations. Customized Addition Worksheet Maker (Vertical) - NEW! This worksheet generator will create your own customized/personalized addition worksheet. 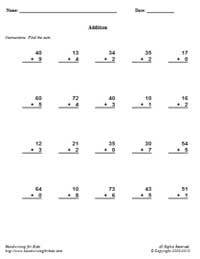 You enter your own vertical math problems in a printable worksheet. Maximum 5 digits x 5 digits (5x5). Online Math - Addition Math Drill Maker - 2 Digits/1 Digit (Vertical) - NEW! This online/interactive math addition generator will provides plenty of online math practice, boost test scores and prepare the child/children to meet the Grade 1, Grade 2, and Grade 3 curriculum standards. This online/interactive math addition, will create the vertical 2 digits by 1 digit (2x1) and 1 digit by 2 digits (1x2) equations with an option of timed test, and it will automatically graded/scored your results in a printable worksheet. 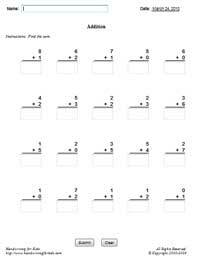 Addition Worksheet Maker - 2 Digits/1 Digit (Vertical) - NEW! This printable basic math addition worksheet generator will provides additional of math practice, boost test scores and prepare the child/children to meet the Grade 1, Grade 2, and Grade 3 curriculum standards. 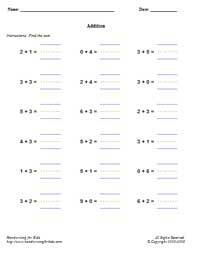 This math worksheet maker will create the vertical math addition, 2 digits by 1 digit (2x1), and 1 digit by 2 digits (1x2) equations with handwriting lines. 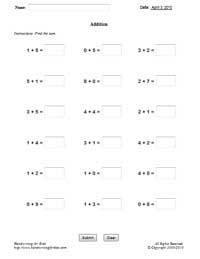 This printable basic math addition worksheet generator will provides additional of math practice, boost test scores and prepare the child/children to meet the Grade 1, Grade 2, and Grade 3 curriculum standards. This math worksheet maker will create the vertical math addition, 2 digits by 1 digit (2x1), and 1 digit by 2 digits (1x2) equations without the handwriting lines. Online Math - Addition Math Drill Maker (Horizontal) - NEW! This online/interactive math addition generator will provides plenty of online math practice, boost test scores and prepare the child/children to meet the Kindergarten, Grade 1, and Grade 2 curriculum standards. This online/interactive math addition, will create the horizontal 1 digit by 1 digit (1x1) equations with an option of timed test, and it will automatically graded/scored your results in a printable worksheet. This printable basic math addition worksheet generator will provides plenty of math practice, boost test scores and prepare the child/children to meet the Kindergarten, Grade 1, and Grade 2 curriculum standards. This math worksheet maker will create the horizontal math addition, 1 digit by 1 digit (1x1) equations with handwriting lines. This printable basic math addition worksheet generator will provides plenty of math practice, boost test scores and prepare the child/children to meet the Kindergarten, Grade 1, and Grade 2 curriculum standards. This math worksheet maker will create the horizontal math addition, 1 digit by 1 digit (1x1) equations without handwriting lines. Customized Addition Worksheet Maker (Horizontal) - NEW!